How we love autumn... You are invited to put on your party shoes and join us under the stars. There’ll be fire to warm your hands; soup to warm your toes, and music to warm your heart. Oh, and parkin. Familiar faces include duffle coats and dried flowers. Then there are the surprise guests – Danish smørrebrød and buttery baked medlars. And don’t we all love a toffee apple? RSVP The Simple Things. 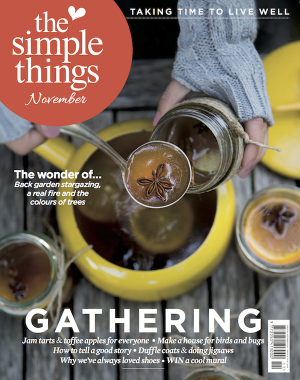 Out now, The Simple Things November issue is available from all good newsagents and supermarkets, or you can buy online or download an issue now.